Pre-TCR and IL-7R signals regulate β-selection of thymocytes and then must be down-regulated for further development. However, the molecular events that control down-regulation remain unknown. We and others have previously shown that β-catenin in cooperation with TCF regulates β-selection. In this paper, we demonstrate that β-catenin expression is stringently regulated by intrathymic signals, it is expressed at the highest levels in the pre-TCR signaled thymocytes, and is down-regulated in post-β-selection thymocytes. Pre-TCR-induced β-catenin regulates initial stages of pre-TCR signaling including expression of early growth response (Egr) genes but must be down-regulated to express RORγt, which is essential for maturation to the CD4+CD8+ double positive (DP) stage. 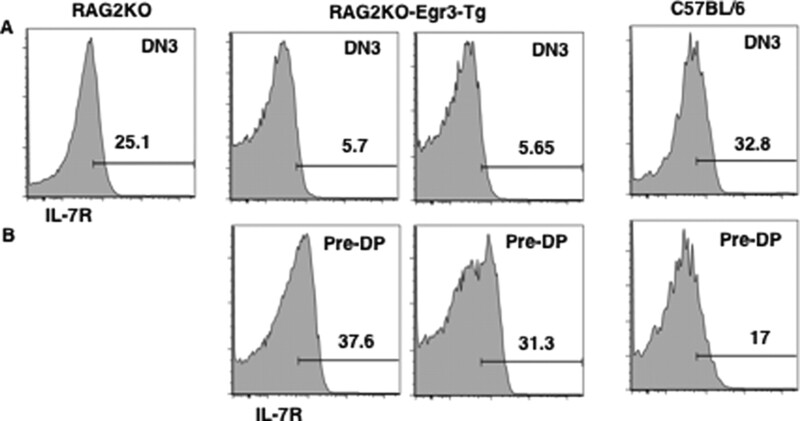 Sustained expression of β-catenin results in the generation of IL-7R-, Egr-, and TGFβ-expressing pre-DP thymocytes that are blocked in development. These data are consistent with a model in which post-β-selection, pre-TCR-induced β-catenin expression must return to background levels for efficient transition to the DP stage. Intrathymic signals regulate gene expression in developing thymocytes and direct T cell development. This notion found experimental support when interrogation of ex vivo thymocytes demonstrated stage-dependent induction of transcription factors (1, 2). In the thymus, earliest αβ T lineage committed precursors express a pre-TCR composed of a nonrearranging pre-Tα protein and the rearranged TCRβ chain (3, 4, 5). Signaling through the pre-TCR mediates cell survival and proliferation of cells expressing a competent TCRβ chain (6). Subsequently, pre-TCR expression is down-regulated and cells return to quiescence before rearrangement of the TCRα locus at the CD4+CD8+ double positive (DP)3 stage (7, 8). At the DP stage, αβTCR-expressing cells are subject to positive and negative selection to ensure self-restriction and avoid autoimmunity (9, 10, 11, 12). Transcription factors early growth response (Egr)1, 2, and 3 are expressed during thymocyte development and induced in response to pre-TCR signaling (13, 14). Overexpression of Egr proteins in pre-TCR signaling-deficient thymocytes facilitates transition through the β-selection checkpoint, while Egr3-deficient mice show a block at the DN3 stage of development (13, 14, 15). Thus, Egr proteins are targets of pre-TCR signaling and regulate several essential aspects of β-selection checkpoint. A key regulator of the transition to the DP stage is the orphan nuclear hormone receptor RORγt, an isoform of the RORγ gene specifically expressed in DP thymocytes (16, 17, 18). Recently repression of RORγt expression by Egr proteins was shown to impair effective transition of DN4/pre-DP thymocytes to the DP stage (19). Signals from the IL-7R were shown to be essential at early stages of T cell development (20, 21). But prolonged expression of the IL-7R prevented expression of essential transcription factors such as TCF and RORγt, which was detrimental to efficient developmental progression (22, 23). These observations suggest that an intricate, precisely regulated developmental program entailing expression of TCF, Egr proteins, and RORγt regulates development of immature double negative (DN) thymocytes to the DP stage. Deletion of Wnt genes (24), T cell-specific deletion of β-catenin (25), and LEF and TCF double deficiency result in a block in early thymocyte development (26, 27, 28). Conversely, overexpression of β-catenin facilitates the maturation of DN thymocytes to the DP stage, even without the expression of pre-TCR or the TCRβ chain, suggesting that β-catenin overexpression is able to substitute for β-selection signals (29). 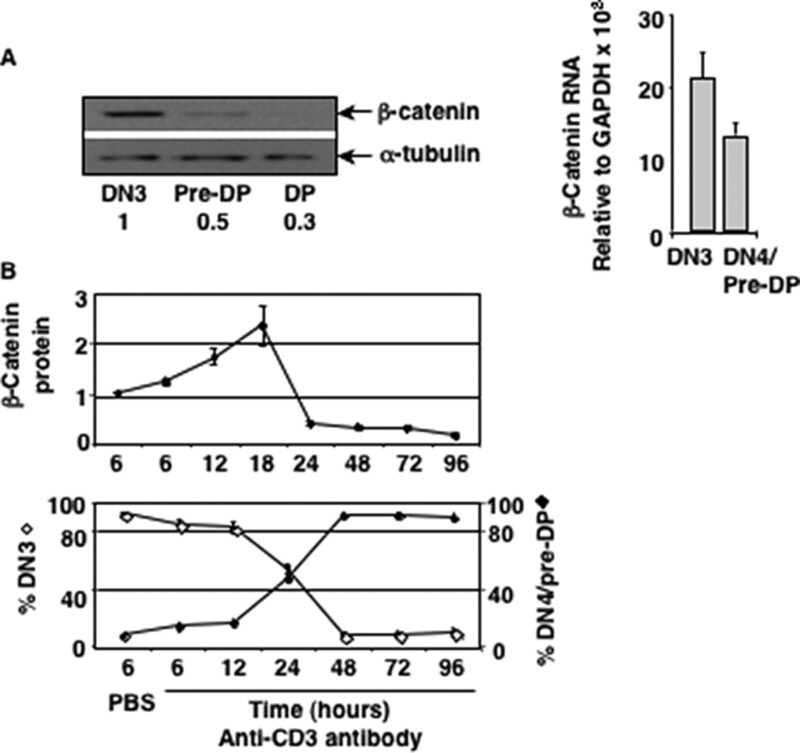 These data demonstrate that β-catenin stabilization was necessary and sufficient for the transition of DN thymocytes to the DP stage. Accordingly, blocking Wnt signaling by expression of extracellular inhibitors, modified Frizzled receptors or Dickkopf (30) or intracellular inhibitors Axin or ICAT (31, 32) impaired thymocyte development or survival. Despite this body of data pointing to the importance of Wnt-β-catenin-TCF signaling, the role of β-catenin in lymphocyte development remains controversial in large measure due to three reports that showed that deletion of β-catenin in hemopoietic stem cells did not impair hematopoiesis or lymphopoiesis (33, 34, 35). The demonstration by Jeannet et al. (35) that TCF-reporter activity remained measurable in all hemopoietic stem cell-derived cells was particularly intriguing and suggested that the Wnt signaling pathway may not have been impaired after all. Thus, this observation when taken together with gain- and loss-of-function experiments suggests β-catenin signaling is both necessary and sufficient for traversal of the β-selection checkpoint (25, 29, 36, 37). However, the molecular mechanisms involved in pre-TCR-dependent β-catenin activation remain unknown. We have recently demonstrated that pre-TCR induced β-catenin directly up-regulates expression of Egr genes and facilitates traversal through β-selection (49). In this report, we demonstrate that pre-TCR-induced stabilization of β-catenin is transient and must be down-regulated for efficient maturation to the DP stage. First, we demonstrate that intrathymic signals stabilize β-catenin in DN3 cells in response to pre-TCR signals and down-regulate its expression as cells mature to the DN4/pre-DP and to the DP stage. Second, we show that pre-TCR-induced β-catenin regulates the expression of IL-7R, Egr, and RORγt genes that control transition of DN cells to the DP stage of development. Finally, we demonstrate that sustained expression of β-catenin in post-β-selection thymocytes maintained expression of Egr genes, IL-7R, and repressed expression of RORγt, which is required for transition to the DP stage. IL-7R+ pre-DP thymocytes were blocked at the pre-DP stage and accumulated in CAT-transgenic (Tg) thymuses. Interestingly, a similar IL-7R expressing DN population was identified in wild-type thymuses, suggesting failure to down-regulate pre-TCR-induced β-catenin may be a feature of some thymocytes during normal maturation. These data demonstrate that β-catenin activation at β-selection is normally transient. We propose that the main role for β-catenin is at the initial stages, and not the terminal stages, of β-selection when DP cells are normally being generated. CAT-Tg mice were described previously (38, 39). RAG2-deficient mice were purchased from The Jackson Laboratory. Egr3 Tg mice were generated using the VA-hCD2 vector, which directs transgene expression in T cells beginning with DN2/3 stage thymocytes (40, 41). An Egr3 cDNA encompassing the translational start and stop codons was generated by PCR, sequence verified, subcloned into VA-hCD2 using standard methodology, and injected by the Fox Chase Transgenic Mouse Facility. Founders were bred to RAG2−/− mice. Where not specified, age-matched 8- to 12-wk-old C57BL/6 and CAT-knockout (KO) and CAT-Tg littermate mice were used. All animal procedures were in compliance with the guidelines of National Institute on Aging animal resources facility, which operates under the regulatory requirements of the U.S. Department of Agriculture and Association for Assessment and Accreditation of Laboratory Animal Care. Four-color flow cytometry was done using FACSCalibur (BD Pharmingen) following staining with combination of Abs anti-CD3, CD4, CD8, CD25, CD44, c-Kit, IL-7R, TCRα, and TCRβ conjugated to FITC, PE, allophycocyanin, or PercpCy5.5 (BD Pharmingen). Lineage mixture contained Abs to CD4, CD8, TCRβ, TCRγδ, B220, NK1.1, Gr1, and Mac-1. For cell sorting, cell suspensions of thymocytes were stained with biotinylated anti-CD4 and anti-CD8 Abs, followed by incubation with anti-biotin microbeads (Miltenyi Biotec) and magnetic depletion of DP and single-positive cells. Enriched cell suspensions were surface-stained with anti-CD25, anti-c-Kit, and lineage Ab mixture followed by sorting using MoFlo. mRNA from sorted cells was extracted with RNeasyMicro Kit (Qiagen). cDNA was prepared with Superscript II RT kit (Invitrogen). SYBR green quantitative RT-PCR was performed using PCR Master Mix from A&B Applied Biosystem following the manufacturer’s instruction. The calculation was done by standard methods. The expression of target gene was determined relative to GAPDH and calculated as 2−(CtTarget gen− CtGAPDH). All the primer sequences are available upon request. Immunoblotting was performed with whole-cell lysates resolved on 4–12% Bis-Tris SDS-PAGE, transferred to nitrocellulose membrane, and detected using Abs against mouse β-catenin (BD Transduction Laboratory) and mouse α-tubulin (Sigma-Aldrich). To determine whether intrathymic signals stabilized β-catenin during normal thymocyte maturation, we assayed regulation of β-catenin protein in ex vivo sorted DN3 (CD25+CD44−/c-Kit−), DN4/pre-DP (CD25−CD44−/c-Kit−), and DP thymocytes. We found that DN3 thymocytes showed the highest level of β-catenin protein, which decreased as cells proceeded to the pre-DP and DP stages (Fig. 1⇓A, left panel). The abundance of β-catenin mRNA was also highest in DN3 cells and decreased in pre-DP thymocytes (Fig. 1⇓A, right panel) and remained unchanged as thymocytes developed to the DP stage (42). We conclude that intrathymic signals at the DN3 to DN4/pre-DP transition regulate β-catenin expression. To determine whether pre-TCR signal stabilized β-catenin protein, we used a well-defined model system in which anti-CD3 Ab is injected in RAG2-deficient mice to initiate pre-TCR signal and β-selection (43). RAG2-deficient thymocytes stimulated with anti-CD3 Ab stabilized β-catenin protein in vivo (Fig. 1⇑B, upper panel). The highest level of β-catenin was stabilized at the 18 h time point, when most cells have received a pre-TCR signal, and declined precipitously by the 24 h time point when we expect that the majority of thymocytes may be committed to transition to the DN4/pre-DP stage (Fig. 1⇑B, lower panel). By 48 to 72 h postanti-CD3 Ab injection, when β-catenin expression was reduced to its lowest level, majority of pre-TCR signaled DN3 (CD44+/c-Kit−CD25+) thymocytes had matured to the DN4/pre-DP (CD44−/c-Kit−CD25−) stage (Fig. 1⇑B). These data demonstrate that pre-TCR induced β-catenin stabilization was transient and declined as cells matured to the DP stage of development. To investigate the importance of intrathymic down-regulation of β-catenin, we used CAT-Tg mice that express stabilized human β-catenin gene from the proximal Lck promoter (38). We have previously shown that mRNA for the transgene was not expressed in DN2 cells (44), expressed at very low levels in sorted DN3 cells, and was sharply induced in the DN4/pre-DP cells (Fig. 2⇓A, left panel). Additionally, we have shown that β-catenin protein levels matched mRNA levels in DN3 and DN4 cells (44). Analysis of the distribution of thymocytes in DN subsets in CAT-Tg mice showed a relative decrease in the DN3 (c-Kit−CD25+) cells and an increase in the DN4/pre-DP (c-Kit−CD25−) cells (Fig. 2⇓A, right panel). To determine whether increased transition of DN3 cells to the DN4 stage was associated with enhanced pre-TCR signaling, we assayed for expression of Egr3, which has been previously implicated as a target of pre-TCR signaling (13, 14). Expression of Egr3 in CAT-Tg DN3 cells was comparable to control DN3 cells but was increased in CAT-Tg DN4/pre-DP cells compared with control DN4/pre-DP cells (data not shown). Together these observations demonstrate that expression of Tg β-catenin was sufficient to facilitate β-selection. Egr proteins, in particular Egr3, critically regulate pre-TCR induced proliferation of pre-DP thymocytes (14). Because pre-DP cells in CAT-Tg mice express higher levels of Egr3, more proliferation and larger thymuses might be expected. However, CAT-Tg mice have reduced thymocyte numbers and show enhanced thymic involution with age (38, 39). To address this conundrum, we further characterized the pre-DP thymocyte population in CAT-Tg mice (Fig. 2⇑B). Phenotypic characterization showed a similar pattern of intracellular TCRβ (TCRβIC) chain expression and γδ TCR expression in CAT-Tg and control DN3 cells (data not shown). Control and CAT-Tg DN3 cells also express comparable levels of cell surface IL-7Rα chain (Fig. 2⇑B, left panels). A small fraction (∼3%) of control pre-DP thymocytes express IL-7R, whereas the frequency of IL-7R+ pre-DP thymocytes was increased (23%) in CAT-Tg thymuses (Fig. 2⇑B, middle panels). Majority of IL-7R+ pre-DP thymocytes from control and CAT-Tg mice expressed comparable levels of TCRβIC, indicating that these cells were pre-DP thymocytes (Fig. 2⇑B, right panels). 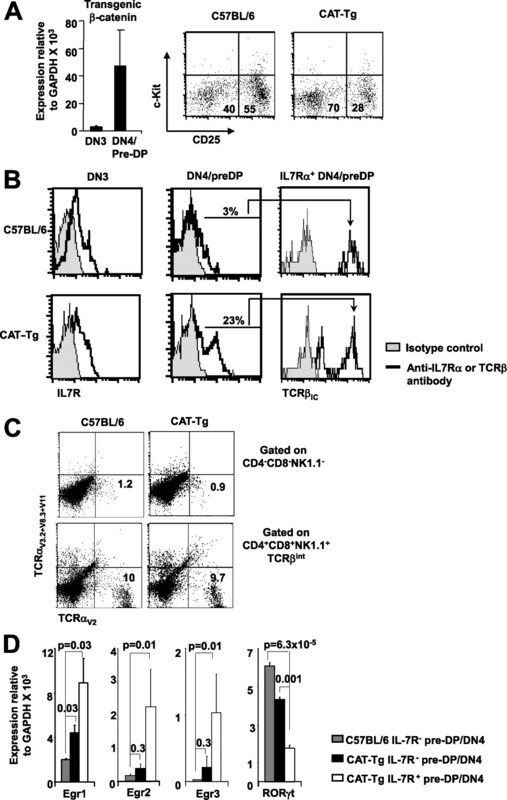 A small subset of CAT-Tg IL-7R+ thymocytes lacked expression of TCRβIC (Fig. 2⇑B). We propose the thymocytes lacking TCRβIC expressed very high levels of β-catenin, which has been shown to abrogate TCRβ chain rearrangement and expression (29, 45). These data suggest that the IL-7R+ DN cells were immature thymocytes. To further assess whether the IL-7R+ DN cells were immature thymocytes, we stained thymocytes with a pool of anti-TCRα Abs (Fig. 2⇑C). The data showed that whereas ∼10% control and CAT-Tg DP thymocytes expressed the assayed TCRα proteins on the cell surface, the frequency of control and CAT-Tg NK1.1− DN thymocytes expressing TCRα was very low and comparable. These data demonstrate that the IL-7R+ DN thymocytes were pre-DP and confirm their immature status. We conclude that a small fraction of DN3 thymocytes give rise to IL-7R+ pre-DP thymocytes and the frequency of these cells is increased in CAT-Tg thymuses. We propose that during normal thymocyte development, a similar situation may result from failure to down-regulate pre-TCR induced β-catenin post-β-selection. Next, we characterized molecular features of IL-7R+ pre-DP thymocytes ex vivo. We assayed for the abundance of Egr and RORγt mRNAs, as these proteins have been implicated in the maturation of pre-DP thymocytes to the DP stage. RNA was prepared from ex vivo sorted IL-7R− pre-DP thymocytes from control and CAT-Tg mice and IL-7R+ pre-DP thymocytes from CAT-Tg mice. IL-7R− pre-DP thymocytes from CAT-Tg mice expressed somewhat higher levels of Egr 1, 2, and 3 mRNA and lower level of RORγt mRNA compared with control IL-7R− pre-DP thymocytes (Fig. 2⇑D). However, IL-7R+ pre-DP thymocytes from CAT-Tg mice expressed dramatically higher levels of Egr 1, 2, and 3 mRNA and much lower level of RORγt mRNA (Fig. 2⇑D). These molecular characteristics demonstrate that sustained expression of β-catenin protein increases expression of Egr proteins while repressing RORγt expression. We propose that the small fraction (3%) of wild-type IL-7R+ pre-DP thymocytes also has similar molecular characteristics and express high levels of Egr and low levels of RORγt mRNA ex vivo. Suppression of RORγt protein by Egr3 expression has previously been shown to regulate the DN3 to DN4/pre-DP transition (14). We conclude that the inability to down-regulate Tg β-catenin in post-β-selection pre-DP thymocytes leads to the generation of this abnormal population. To examine the relationship between Egr3 and IL-7R expression, we studied IL-7R expression in the DN compartment of RAG2KO-Egr3-Tg mice. Expression of Egr3 transgene partially promoted the development of RAG2-deficient thymocytes to the to the DN4/pre-DP and then to the DP stage (14) (data not shown). The fraction of cells expressing IL-7R decreases as DN3 thymocytes mature to the pre-DP stage in control mice (46) (Fig. 3⇓). Interestingly, compared with control a greater proportion of pre-DP thymocytes in RAG2KO-Egr3-Tg mice expressed IL-7R (data from two mice is shown) (Fig. 3⇓B). Forward light scatter analysis showed that RAG2KO-Egr3-Tg DN4 cells were smaller compared with RAG3KO DN3 thymocytes (data not shown). Therefore, the increase in IL-7R expression is unlikely to reflect increased cell size. These data demonstrate that Egr3 expression was sufficient to promote the maturation of RAG2-deficient IL-7R+ pre-DP thymocytes. To determine whether β-catenin-dependent overexpression of Egr family members resulted in a block in development in vivo, we analyzed adult CAT-Tg mice. We have previously reported that CAT-Tg mice have lower thymic cellularity (38). In this study, we show that the percentage of DN thymocytes is increased in CAT-Tg thymuses compared with C57BL/6 thymuses (Fig. 4⇓A, left panel). A more dramatic accumulation is noted in some mice (Fig. 4⇓A), and these thymuses were lower in cellularity. 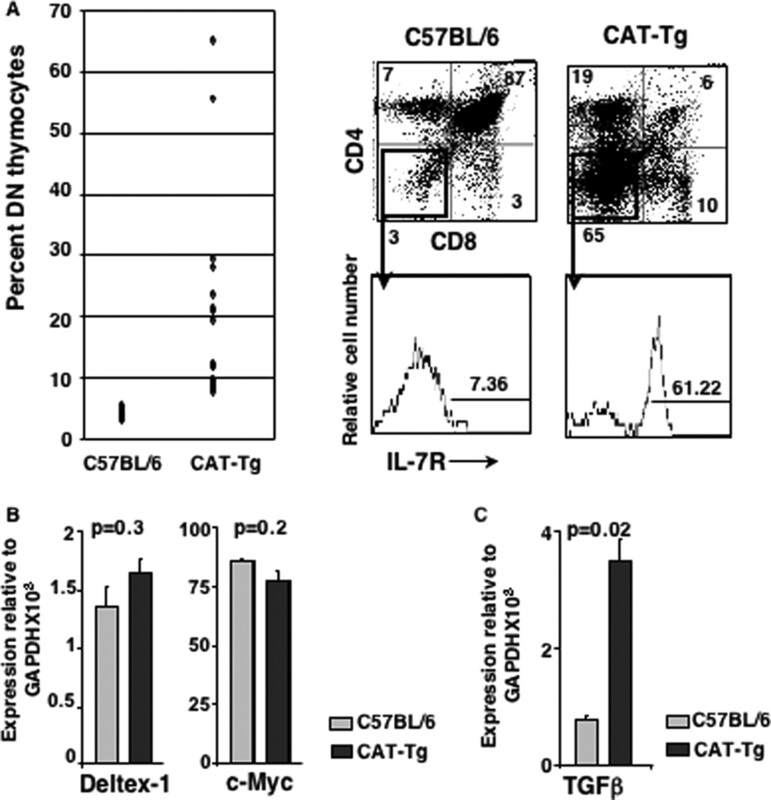 Approximately 60% of CAT-Tg DN thymocytes compared with 7% C57BL/6 DN thymocytes expressed IL-7R (Fig. 4⇓A). Because IL-7R+ pre-DP thymocytes fail to up-regulate RORγt, which is required for development to the DP stage, we suggest that these cells are a dead-end population. Furthermore, we propose that the increase in this dead-end population is the reason for decreased thymic cellularity in CAT-Tg mice. Next, we determined whether Notch and c-myc signaling pathways, known to regulate thymocyte development, were impacted by β-catenin expression and contributed to the generation of the dead-end population. We found that Notch signaling was not impaired as expression of Deltex-1, a target of Notch signaling, was comparable in CAT-Tg and control DN thymocytes. We also found that expression of c-myc was comparable in CAT-Tg and control DN thymocytes (Fig. 4⇑B). These data suggest that the function of β-catenin was independent of these regulators of thymocyte development. In accordance with data shown in Fig. 2⇑, molecular analysis of CAT-Tg DN thymocytes showed significantly higher abundance of Egr 1, 2, and 3, and low levels of RORγt expression compared with control DN cells (data not shown). In addition, we noted increased expression of TGFβ mRNA (Fig. 4⇑C), which may also contribute to the block in development (47). Thus, we conclude that sustained expression of β-catenin in pre-TCR-signaled thymocytes blocks their development to the DP stage due to aberrant expression of Egr genes, RORγt and TGFβ. We propose that down-regulation of pre-TCR-induced signals is an essential aspect of proper T cell development in the thymus. Finally, we directly tested the developmental potential of IL-7R+ pre-DP thymocytes using a previously described in vitro assay (23, 47). In this assay, pre-DP thymocytes that have received the pre-TCR signals in vivo mature to the DP stage when cultured for 18 to 24 h in vitro (Fig. 5⇓A). CAT-Tg and control pre-DP populations were sorted into IL-7R− pre-DP and IL-7R+ pre-DP thymocytes and cultured in vitro for 20–24 h. Approximately 70% sorted IL-7R− pre-DP thymocytes from control and CAT-Tg mice developed into DP thymocytes while 30% remained DN (Fig. 5⇓, B and C). In contrast, a significant fraction of IL-7R+ pre-DP thymocytes from control and CAT-Tg mice remained DN (Fig. 5⇓C). These data demonstrate that IL-7R+ pre-DP thymocytes from control as well as CAT-Tg mice failed to progress efficiently to the DP stage. In conclusion, the data presented in this report demonstrate that during thymocyte maturation in the thymus, pre-TCR signals induce expression of β-catenin in DN3 cells, which must be down-regulated in pre-DP thymocytes. Failure to down-regulate pre-TCR-induced β-catenin leads to the development of a dead-end IL-7R+ pre-DP population that sustains expression of Egr genes and fails to express RORγt, which is required for maturation to the DP stage. We propose that pre-TCR signals induce stabilization of β-catenin, with or without the involvement of the canonical Wnt-signaling pathway, which facilitates β-selection but must be down-regulated as cells mature to the DP stage. Intrathymic signals use a number of transcription factors that have also been implicated in oncogenesis to regulate T cell development in the thymus. A precise and tight regulation of potentially oncogenic signaling molecules is essential to prevent lymphomagenesis. In this report, we demonstrate that sustained expression of β-catenin, a powerful oncogene, leads to a block in T cell development. Taken together with our previous report demonstrating that thymocytes expressing oncogenic β-catenin show dramatic oncogene-induced senescence (OIS), DNA damage, and p53-dependent apoptosis (44), these data suggest that thymocytes unable to precisely regulate β-catenin expression during development are removed from the developmental pool of cells. In addition, data in this report propose for the first time that down-regulation of pre-TCR signals in post-β-selection thymocytes is an important aspect of T cell development. Intrathymic signals stabilized β-catenin in DN3 thymocytes, which is then down-regulated as thymocytes developed to the pre-DP and DP stages. Experiments with RAG2-deficient mice indicated that pre-TCR signals up-regulated β-catenin stabilization, which in conjunction with the observation that T cell specific deletion of β-catenin impaired β-selection (25), suggests a role for β-catenin in β-selection. Accordingly, enforced expression of β-catenin led to an increase in postβ-selection thymocytes in CAT-Tg mice. These data are in agreement with previous report showing that over-expression of β-catenin in RAG-deficient DN3 cells was sufficient to bypass β-selection and give rise to TCRβ− DP thymocytes (29). The small proportion of CAT-Tg DN4 thymocytes (Fig. 2A⇑) that express low levels of TCRβIC represent cells that may express high levels of β-catenin and bypass β-selection (29, 45). We propose that pre-TCR induced β-catenin facilitates β-selection. However, β-catenin was down-regulated as cells passed through β-selection. Our data show that TCRβIC negative as well as TCRβIC and IL-7R-expressing post-β-selection thymocytes up-regulate expression of TGFβ, which blocks their development. We propose that sustained expression of β-catenin in post-β-selection thymocytes indicates inappropriate β-selection and blocks further development via expression of inhibitory molecules such as TGFβ. However, the observation that CAT-Tg mice were not lacking in DP thymocytes suggested that a subset of CAT-Tg pre-DP thymocytes could execute the pre-DP to DP transition reasonably well. This might be surprising in light of the data presented in this report. An explanation was found in the bimodal expression of IL-7R on CAT-Tg pre-DP thymocytes (Fig. 2⇑). 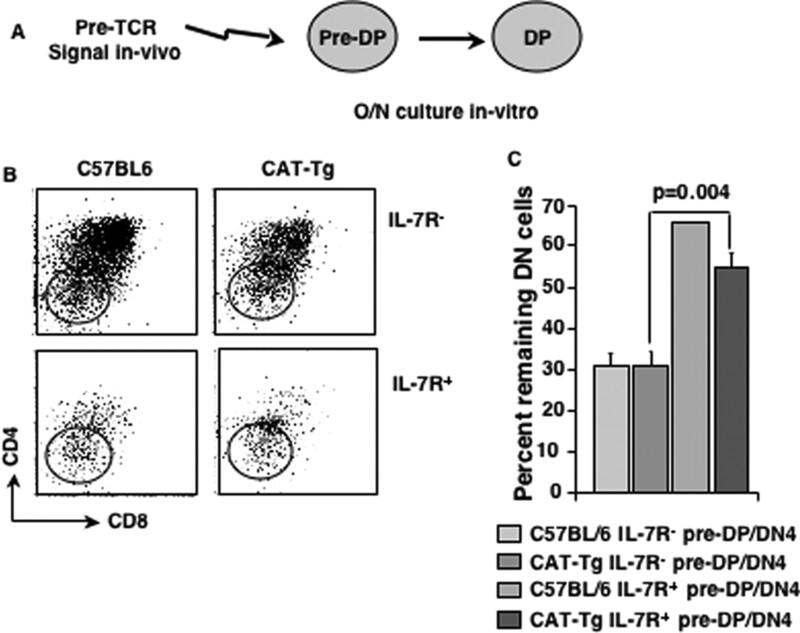 The IL-7R− pre-DP cells in CAT-Tg thymuses successfully down-regulate β-catenin before progressing to the DP stage, whereas the IL-7R+ pre-DP cells are blocked in development. Accordingly, CAT-Tg DP thymocytes express very low levels of the Tg β-catenin protein (42). The molecular mechanism by which β-catenin protein lacking the GSK3β phosphorylation domain is degraded in pre-DP and DP thymocytes remains under investigation. It is important to note that endogenous intrathymic signals stringently regulate β-catenin expression during mouse thymocyte development with the greatest stabilization in the DN3 compartment followed by a steady decline in pre-DP and DP thymocytes in mouse thymocytes (this study and Ref. 42). Similar regulation has also been noted in human thymocytes (48). Data presented in this report suggest that IL-7R expression on pre-DP thymocytes identifies a population of cells that have failed to down-regulate pre-TCR-induced β-catenin. These cells will not mature to the DP stage and are instead removed from the pool of developing cells by apoptosis, which we have previously reported (44) to be p53 dependent. Interestingly, IL-7R-expressing pre-DP thymocytes were previously shown to be blocked from development to the DP stage due to inhibition of essential transcription factors (23). Together, these findings indicate that multiple pre-TCR-induced transcription factors, including β-catenin, facilitate β-selection but must be down-regulated as thymocyte navigate the β-selection checkpoint and mature to the DP stage. We have previously demonstrated that expression of oncogenic β-catenin renders DN thymocytes susceptible to OIS, DNA damage, growth arrest, and p53-dependent apoptosis (44). We demonstrated that in the absence of p53 function IL-7R+ pre-DP thymocytes failed to undergo apoptosis and an IL-7R+ pre-DP thymic lymphoma developed. Interestingly, CAT-Tg DN thymocytes showed increased expression of senescence associated genes but not genes associated with apoptosis (data not shown). This was not surprising as in our previous analysis (25), OIS, DNA damage, and growth arrest were found to be p53 independent, whereas apoptosis was p53 dependent. These observations suggest that sustained expression of pre-TCR-induced β-catenin has the potential to promote lymphoma formation; therefore, these blocked thymocytes are removed from the pool by apoptosis. In summary, we demonstrate that pre-TCR-induced β-catenin stabilization controls traversal through β-selection checkpoint but must be subsequently down-regulated. Failure to down-regulate β-catenin expression blocks the further development. We thank Tiffany Simms for technical assistance; Dr. Qing Yu for helpful suggestions throughout this work and careful reading of the manuscript; Dr. Robert Wersto, Francis J. Chrest, and Cuong Nguyen for expert cell sorting; Crystal Gifford, Dawn Nines, and Tina Smith for maintaining animals; and Dr. Shengyuan Luo and team for genotyping. 1 This research was supported by the Intramural Research Program of the National Institute on Aging at the National Institutes of Health. 3 Abbreviations used in this paper: DP, double positive; DN, double negative; Egr, early growth response; Tg, transgenic; KO, knockout; TCRβIC, intracellular TCRβ; OIS, oncogene-induced senescence. Sen, J., Y. Shinkai, F. W. Alt, R. Sen, S. J. Burakoff. 1994. Nuclear factors that mediate intrathymic signals are developmentally regulated. J. Exp. Med. 180: 2321-2327. Sen, J., L. Venkataraman, Y. Shinkai, J. W. Pierce, F. W. Alt, S. J. Burakoff, R. Sen. 1995. Expression and induction of nuclear factor-κ B-related proteins in thymocytes. J. Immunol. 154: 3213-3221. Aifantis, I., M. Mandal, K. Sawai, A. Ferrando, T. Vilimas. 2006. Regulation of T-cell progenitor survival and cell-cycle entry by the pre-T-cell receptor. Immunol. Rev. 209: 159-169. Ciofani, M., J. C. Zuniga-Pflucker. 2006. A survival guide to early T cell development. Immunol. Res. 34: 117-132.
von Boehmer, H.. 2005. Unique features of the pre-T-cell receptor α-chain: not just a surrogate. Nat. Rev. Immunol. 5: 571-577. Hoffman, E. S., L. Passoni, T. Crompton, T. M. Leu, D. G. Schatz, A. Koff, M. J. Owen, A. C. Hayday. 1996. Productive T-cell receptor β-chain gene rearrangement: coincident regulation of cell cycle and clonality during development in vivo. Genes Dev. 10: 948-962. Jiang, H., F. C. Chang, A. E. Ross, J. Lee, K. Nakayama, K. Nakayama, S. Desiderio. 2005. Ubiquitylation of RAG-2 by Skp2-SCF links destruction of the V(D)J recombinase to the cell cycle. Mol. Cell. 18: 699-709. Jiang, H., A. E. Ross, S. Desiderio. 2004. Cell cycle-dependent accumulation in vivo of transposition-competent complexes between recombination signal ends and full-length RAG proteins. J. Biol. Chem. 279: 8478-8486. Janeway, C. A., Jr. 1999. T-cell development: a role for self-peptides in positive selection. Curr. Biol. 9: R342-R345. Saito, T., N. Watanabe. 1998. Positive and negative thymocyte selection. Crit. Rev. Immunol. 18: 359-370. Fowlkes, B. J., E. Schweighoffer. 1995. Positive selection of T cells. Curr. Opin. Immunol. 7: 188-195. Jameson, S. C., K. A. Hogquist, M. J. Bevan. 1995. Positive selection of thymocytes. Annu. Rev. Immunol. 13: 93-126. Carleton, M., M. C. Haks, S. A. Smeele, A. Jones, S. M. Belkowski, M. A. Berger, P. Linsley, A. M. Kruisbeek, D. L. Wiest. 2002. Early growth response transcription factors are required for development of CD4−CD8− thymocytes to the CD4+CD8+ stage. J. Immunol. 168: 1649-1658. Xi, H., G. J. Kersh. 2004. Early growth response gene 3 regulates thymocyte proliferation during the transition from CD4−CD8− to CD4+CD8+. J. Immunol. 172: 964-971. Carter, J. H., J. M. Lefebvre, D. L. Wiest, W. G. Tourtellotte. 2007. Redundant role for early growth response transcriptional regulators in thymocyte differentiation and survival. J. Immunol. 178: 6796-6805. Eberl, G., S. Marmon, M. J. Sunshine, P. D. Rennert, Y. Choi, D. R. Littman. 2004. An essential function for the nuclear receptor RORγ(t) in the generation of fetal lymphoid tissue inducer cells. Nat. Immunol. 5: 64-73. He, Y. W., C. Beers, M. L. Deftos, E. W. Ojala, K. A. Forbush, M. J. Bevan. 2000. Down-regulation of the orphan nuclear receptor ROR γ t is essential for T lymphocyte maturation. J. Immunol. 164: 5668-5674. He, Y. W., M. L. Deftos, E. W. Ojala, M. J. Bevan. 1998. RORγ t, a novel isoform of an orphan receptor, negatively regulates Fas ligand expression and IL-2 production in T cells. Immunity 9: 797-806. Xi, H., R. Schwartz, I. Engel, C. Murre, G. J. Kersh. 2006. Interplay between RORγt, Egr3, and E proteins controls proliferation in response to pre-TCR signals. Immunity 24: 813-826. Di Santo, J. P., I. Aifantis, E. Rosmaraki, C. Garcia, J. Feinberg, H. J. Fehling, A. Fischer, H. von Boehmer, B. Rocha. 1999. The common cytokine receptor γ chain and the pre-T cell receptor provide independent but critically overlapping signals in early α/β T cell development. J. Exp. Med. 189: 563-574. Trop, S., P. De Sepulveda, J. C. Zuniga-Pflucker, R. Rottapel. 2001. Overexpression of suppressor of cytokine signaling-1 impairs pre-T-cell receptor-induced proliferation but not differentiation of immature thymocytes. Blood 97: 2269-2277. Yasuda, Y., A. Kaneko, I. Nishijima, S. Miyatake, K. Arai. 2002. Interleukin-7 inhibits pre-T-cell differentiation induced by the pre-T-cell receptor signal and the effect is mimicked by hGM-CSF in hGM-CSF receptor transgenic mice. Immunology 106: 212-221. Mulroy, T., J. A. McMahon, S. J. Burakoff, A. P. McMahon, J. Sen. 2002. Wnt-1 and Wnt-4 regulate thymic cellularity. Eur. J. Immunol. 32: 967-971. Verbeek, S., D. Izon, F. Hofhuis, E. Robanus-Maandag, H. te Riele, M. van de Wetering, M. Oosterwegel, A. Wilson, H. R. MacDonald, H. Clevers. 1995. An HMG-box-containing T-cell factor required for thymocyte differentiation. Nature 374: 70-74. Okamura, R. M., M. Sigvardsson, J. Galceran, S. Verbeek, H. Clevers, R. Grosschedl. 1998. Redundant regulation of T cell differentiation and TCRα gene expression by the transcription factors LEF-1 and TCF-1. Immunity 8: 11-20. Schilham, M. W., A. Wilson, P. Moerer, B. J. Benaissa-Trouw, A. Cumano, H. C. Clevers. 1998. Critical involvement of Tcf-1 in expansion of thymocytes. J. Immunol. 161: 3984-3991. Gounari, F., I. Aifantis, K. Khazaie, S. Hoeflinger, N. Harada, M. M. Taketo, H. von Boehmer. 2001. Somatic activation of β-catenin bypasses pre-TCR signaling and TCR selection in thymocyte development. Nat. Immunol. 2: 863-869. Staal, F. J., J. Meeldijk, P. Moerer, P. Jay, B. C. van de Weerdt, S. Vainio, G. P. Nolan, H. Clevers. 2001. Wnt signaling is required for thymocyte development and activates Tcf-1 mediated transcription. Eur. J. Immunol. 31: 285-293. Pongracz, J. E., S. M. Parnell, T. Jones, G. Anderson, E. J. Jenkinson. 2006. Overexpression of ICAT highlights a role for catenin-mediated canonical Wnt signaling in early T cell development. Eur. J. Immunol. 36: 2376-2383. Cobas, M., A. Wilson, B. Ernst, S. J. Mancini, H. R. MacDonald, R. Kemler, F. Radtke. 2004. β-catenin is dispensable for hematopoiesis and lymphopoiesis. J. Exp. Med. 199: 221-229. Koch, U., A. Wilson, M. Cobas, R. Kemler, H. R. Macdonald, F. Radtke. 2007. Simultaneous loss of β- and γ-catenin does not perturb hematopoiesis or lymphopoiesis. Blood 111: 160-164. Jeannet, G., M. Scheller, L. Scarpellino, S. Duboux, N. Gardiol, J. Back, F. Kuttler, I. Malanchi, W. Birchmeier, A. Leutz, et al 2007. Long-term, multilineage hematopoiesis occurs in the combined absence of β-catenin and γ-catenin. Blood 111: 142-149. Goux, D., J. D. Coudert, D. Maurice, L. Scarpellino, G. Jeannet, S. Piccolo, K. Weston, J. Huelsken, W. Held. 2005. Cooperating pre-T-cell receptor and TCF-1-dependent signals ensure thymocyte survival. Blood 106: 1726-1733. Fukushima, T., J. M. Zapata, N. C. Singha, M. Thomas, C. L. Kress, M. Krajewska, S. Krajewski, Z. Ronai, J. C. Reed, S. Matsuzawa. 2006. Critical function for SIP, a ubiquitin E3 ligase component of the β-catenin degradation pathway, for thymocyte development and G1 checkpoint. Immunity 24: 29-39. Mulroy, T., Y. Xu, J. M. Sen. 2003. β-Catenin expression enhances generation of mature thymocytes. Int. Immunol. 15: 1485-1494. Xu, Y., J. Sen. 2003. β-catenin expression in thymocytes accelerates thymic involution. Eur. J. Immunol. 33: 12-18. Zhumabekov, T., P. Corbella, M. Tolaini, D. Kioussis. 1995. Improved version of a human CD2 minigene based vector for T cell-specific expression in transgenic mice. J. Immunol. Methods 185: 133-140. Cleverley, S., S. Henning, D. Cantrell. 1999. Inhibition of Rho at different stages of thymocyte development gives different perspectives on Rho function. Curr. Biol. 9: 657-660. Yu, Q., J. M. Sen. 2007. β-catenin regulates positive selection of thymocytes but not lineage commitment. J. Immunol. 178: 5028-5034. Shinkai, Y., F. W. Alt. 1994. CD3 epsilon-mediated signals rescue the development of CD4+CD8+ thymocytes in RAG-2−/− mice in the absence of TCR β chain expression. Int. Immunol. 6: 995-1001. Xu, M., Q. Yu, R. Subrahmanyam, M. J. Difilippantonio, T. Ried, J. M. Sen. 2008. β-catenin expression results in p53-independent DNA damage and oncogene-induced senescence in prelymphomagenic thymocytes in vivo. Mol. Cell. Biol. 28: 1713-1723. Gounari, F., R. Chang, J. Cowan, Z. Guo, M. Dose, E. Gounaris, K. Khazaie. 2005. Loss of adenomatous polyposis coli gene function disrupts thymic development. Nat. Immunol. 6: 800-809. Trigueros, C., K. Hozumi, B. Silva-Santos, L. Bruno, A. C. Hayday, M. J. Owen, D. J. Pennington. 2003. Pre-TCR signaling regulates IL-7 receptor α expression promoting thymocyte survival at the transition from the double-negative to double-positive stage. Eur. J. Immunol. 33: 1968-1977. Takahama, Y., J. J. Letterio, H. Suzuki, A. G. Farr, A. Singer. 1994. Early progression of thymocytes along the CD4/CD8 developmental pathway is regulated by a subset of thymic epithelial cells expressing transforming growth factor β. J. Exp. Med. 179: 1495-1506. Weerkamp, F., M. R. Baert, B. A. Naber, E. E. Koster, E. F. de Haas, K. R. Atkuri, J. J. van Dongen, L. A. Herzenberg, F. J. Staal. 2006. Wnt signaling in the thymus is regulated by differential expression of intracellular signaling molecules. Proc. Natl. Acad. Sci. USA 103: 3322-3326. Xu, M., A. Sharma, D. L. Wiest, J. M. Sen. 2008. Pre-TCR-induced β-catenin facilitates traversal through β-selectin. J. Immunol. 182: 751-758.